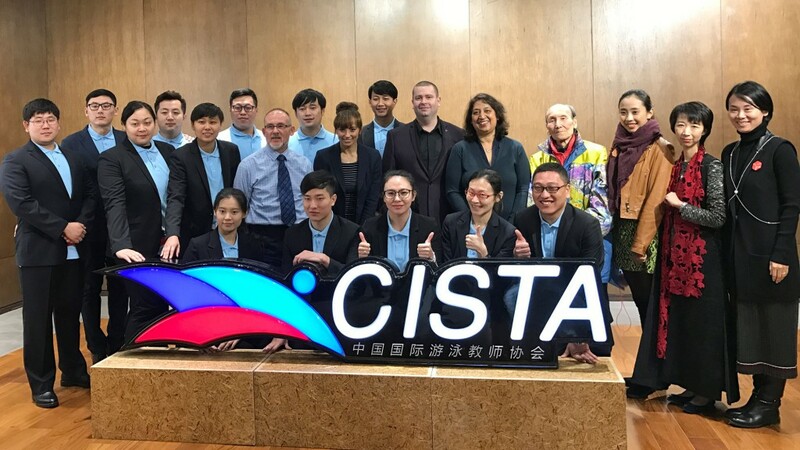 In November, STA was honoured to be invited to Beijing to celebrate the launch of the China International Swimming Teachers’ Association (CISTA). STA CEO Dave Candler and IFSTA CEO Garry Seghers were also invited to speak at the launch ceremony, which was attended by representatives from Government, dignitaries from the Chinese swimming world and the media. Pictured here at the well-attended CISTA media launch are STA’s Dave Candler and Zoe Cooper with Garry Seghers and the attending dignitaries. The prestigious event opened with a presentation from Anita Sharma, CISTA Chief Development Officer and Director of Swimming for Family Box, the biggest provider of baby swim lessons in China and who STA has been working with since 2008 to implement a baby and infant swim programme that is suited to the Chinese culture. This was Dave Candler’s first visit to China since becoming STA CEO, and he was impressed at the sheer scale of Family Box and the magnificent facilities provided to parents. At the ceremony, he said: We have been working in partnership with Family Box for the last 8 years with the aim of raising teaching standards and drowning prevention in China – and what has been achieved in this time is amazing. With government support, Family Box has opened 7 new centres across China, trained over 200 swimming teachers using STA’s British best practice methods, and importantly, has taught many thousands of children how to swim and be safe in and around water. The launch of CISTA will serve to increase these numbers even more, and we at the STA are extremely honoured to be working in partnership to help facilitate these goals and give more people in China the opportunity to learn how to swim in a safe environment, added Dave. Leading on from this, Garry Seghers gave a brief explanation about the aims of IFSTA and how the organisation supports the World Health Organisation’s actions to prevent drowning; specifically to teach school-age children basic swimming, water safety and safe rescue skills. As IFSTA President, Garry said: On behalf of IFSTA, I am delighted to support the launch of CISTA and their aims in drowning prevention and teaching lifesaving and swim skills. I look forward to CISTA joining over 20 IFSTA global member countries in Vancouver next year at the World Conference of Drowning Prevention, where IFSTA will be holding its Annual General Meeting.